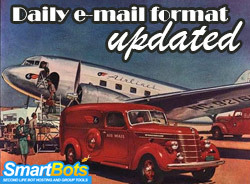 We’ve updated the daily email format. It is almost the same, but contains more useful data now: invitation location, detailed location etc. We are also removing the duplicate invitation entries (which were very annoying within reports from automated script inviters). If you have any wishes on daily report emails, it is a very good time to contact is and make them even better! P.S. We know that some of our fellow customers automatically process these e-mails to extract statistical data. Hope we did not messed much in your systems and our changes will be easy to adopt. 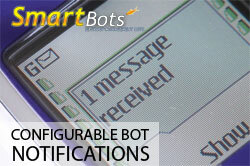 Bot subscription notifications (the forthcoming subscription expiration and expired subscription messages) can be configured for each personal bot now. You can specify if you would like to get an e-mail notification, Second Life IM or both. If you don’t plan to extend your bot’s subscription, you can uncheck the checkboxes and system won’t annoy you anymore. The options can be found in bot’s Settings page: locate your bot image and click “settings” link.